The Penn researchers asked 2,400 Republicans and Democrats to interpret recent climate-change data on Arctic sea-ice levels. Initially, nearly 40 percent of Republicans incorrectly interpreted the data, saying that Arctic sea-ice levels were increasing; 26 percent of Democrats made the same mistake. However, after participants interacted in anonymous social media networks—sharing opinions about the data and its meaning for future levels of Artic sea ice—88 percent of Republicans and 86 percent of Democrats correctly analyzed it, agreeing that sea-ice levels were dropping. "But," Centola adds, "the biggest surprise—and perhaps our biggest lesson—came from how fragile it all was. The improvements vanished completely with the mere suggestion of political party. All we did was put a picture of an elephant and a donkey at the bottom of a screen, and all the social learning effects disappeared. Participants' inaccurate beliefs and high levels of polarization remained." Yeah, Trump tossing rolls of paper towels to hurricane survivors should have been enough to disqualify this man in the eyes of Republican and Democrats alike. What a creep. But facts are facts and climate change is an emergency situation in need of attention, But just like the paper towels, the whole of Republican philosophy is to abuse their fellow man. Same with climate change. Social media needs to work on reducing polilitical polarization - period. This is interesting. The conservative tendency to misinterpret data is one of the most-frustrating things about the issue. Ten years ago, when i was younger and more optimistic, I really thought the issue was that people weren't aware of the data and what we needed was to disseminate it. Now here I am more cynical because I've had ten years of people deliberately ignoring and misinterpreting the information. While the results are promising, they show the issue here isn't data, communication, understanding or interpretation - it's cognitive bias. And we'd need something more substantial to change to overcome that. "But, if you allow people to interact with each other in egalitarian social networks, in which no individual is more powerful than another, we find remarkably strong effects of bipartisan social learning on eliminating polarization." And you also get cases of mass hysteria, kinda like the Salem witch trials. But hey, whether it's shared psychosis or "social learning", depends on which side of the issue you stand as the observer of it. It's worse. People actively mispresent data, cherrypick, fake data, present partial data sets and re-frame issues... the reality itself is irrelevant, it's the political conflict going on in the background that determines what you accept as true, which is to say, the opposite of what the opposition accepts as true. This isn't special to conservatives. Regarding data, the most effective way to tell a lie is to tell only true things, but not the truth. 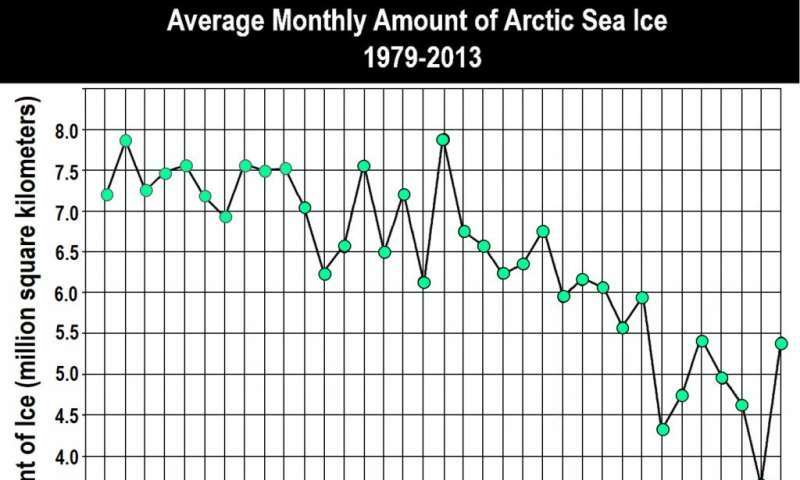 For example, this question of "Is the sea ice increasing or decreasing, here's a graph" - is actually a trick question that has many valid answers. The answer depends on whether you're asking for a trend, or the latest development. A trend is the valid answer is you already assume that there's some effect driving that trend. If we don't assume an effect (eg. no climate change) then a trend is not predictive because we have no reason to assume it continues, and a valid answer will be to look at the last two data points and note that the curve is pointing up - increasing. Whether it will continue to increase is again subject to the same criticism. So, yes, no, unknown, are all perfectly valid answers to the question if we come at it without any other assumptions. It therefore shows the bias of the researchers because they're begging the question of climate change. That means there's no mis-interpretation or error necessary - only a disagreement in premises. To make it extra clear, regardless of what you think of climate change, presenting someone with a graph and judging their judgement to be poor because they don't make the same conclusions which are self-evident to you, based on your premises, is called intellectual dishonesty, because you're covertly defining yourself to be correct on the question. The question isn't really about their intelligence or their ability to read graphs, but about whether they agree with you, and by making the sort of "these people are bad at reading graphs" argument, what you're really saying is "these people are bad at agreeing with my premises". It's also a subtle form of propaganda to ask these questions in order to humiliate the opponent in the eyes of your followers. A slightly different version of this fallacy is, "Look how stupid he is for not knowing what I just learned 5 minutes ago". They're not 'bad at reading graphs'. They actively look at a graph showing one thing and deliberately reframe it to support their existing prejudice. Have a looknat anything by aksdad on this site and you'll see this in action. This is the Chicken Little jackass who boasts about his jaunt to the Antarctic, spewing CO2 all the way. Tell us, jackass, what substantial change do you need to overcome your hypocrisy? Then, again, it's just easier for you jackasses to bray at the heretics, while you burn fossil fuels as if there is no tomorrow. At this point I think people should write down what their criteria for accepting any kind of finding is (including such things as what kind of risks they are willing to take...e.g. whether they are willing to risk driving a car, flying in a plane, what confidence value they accept for a discovery, what confidence value they are comfortable with making personal life/death decisions on etc. )...and THEN they should be exposed to the data. That way they can't choose whether they accept it based on (political/religious) belief or not - they have to stand by their OWN set of guidelines. Climate change is not an emergency you dope. If Miami was underwater I'd agree. They actively look at a graph showing one thing and deliberately reframe it to support their existing prejudice. That's just a different way of saying "They disagree with me, therefore they are stupid". Remember that in order for someone to "re-frame" it, one must enframe it to begin with. You're placing an arbitrary interpretation, however well or poorly justified, on the issue and saying "This is the correct view. This is what everyone should agree to be true.". So, when you complain about re-framing, you're simply saying "How dare they take a different point of view on the data!" Of course this excludes deliberate manipulation and mispresentation of data to make it show what you want. That's a sin practiced by both sides of the question. they have to stand by their OWN set of guidelines. I doubt anyone knows themselves -that- well as to answer all of your questions consistently and then never change their minds. You're essentially demanding them to first become robots to escape being invalidated by hypocrisy. That would be the ultimate stickler for rules. Today I value my life with a coefficient of 0.999991. Tomorrow it may be 0.99999991. With thousands of parameters to consider, how does that affect my conclusion? I remember listening to a woman telling a story about her friend, a buddhist nun. She wanted to buy her a present, so she bought green tea, gave it to her, and asked if it was the correct choice, i.e. whether she had guessed right that she prefers green tea. She replied "When I drink black tea, I like black tea. When I drink green tea, I like green tea". The leetennant JACKASS brays, yet again. So, this jackass, claims he knows the science, can read the graphs and firmly believes CO2 will destroy the world. Yet he boasts about his, CO2 spewing, jaunt to Antarctica and his plans to do the same to the Arctic. If this is the kind who claims they are saving the world, then the AGW Cult has found its "perfect" jackass. No, it's a way of saying "they're wrong because they choose to be wrong". They embrace wrong. They go out of their way to be wrong. They pursue wrong with an enthusiasm bordering on insanity. They see evidence that they are wrong and they use it to support their existing position, despite it being clearly evidentially wrong. It's why the word cognitive dissonance exists. It's why the term 'doubling down' exists. People who are definitively wrong about something ,faced with evidence they are wrong, will double down on the existing wrong position. Because they are committed to that position and cannot handle the evidence that they are wrong. You're just babbling at this point. But let me restate your analogy in a way that's... actually analogous. A woman has a friend who's a Buddhist Nun. She believes that Buddhist Nuns prefer green tea. She asks her friend "Do you like green tea or black tea?" He friend says "I do like green tea but i prefer black tea". So she says "I asked and she confirmed she likes green tea". She buys her green tea. Because Buddhist Nuns prefer green tea. In my opinion, those Republicans and Democrats who claim to be "Conservatives" ?are misusing the concept as a quickie political slogan. They do not have to actually think about conservatism as an active method to guide their own lives. But rather as a means to domineer other peoples lives. These pseudo-conservative reactionaries are expressing their subconscious desire to return to their mother's wombs as mindless fetuses. Rejecting any responsibility for their poor life choices and bungling errors. They do not have the moral capacity to never admit to their mistakes of ignorance and deliberate transgressions against others. They simply lack the internal fortitude to apologize for how they mistreat others. I was never a Trump fan, didn't vote for him... but the more the media bust on him for things he did and didn't do, I root for him more. I loved MSNBC, like 10 years ago. "but the more the media bust on him for things he did and didn't do, I root for him more" Now THAT is the kind of logic that would make for a malfunctioning application. Reality be damned, eh? This is a man who said that Google was engaged in a conspiracy against him because it was letting people know about things he'd actually done and said. Reality is not Russia, you are an idiot if you think Russia has anything to do with anything. That's the big BS story the media is pushing. The media thinks you're stupid or insane, they may be right. Trump says a lot of stupid stuff, and it slides right off him. It will an interesting 2020, Dems have to have someone who can beat him, but might blow it with identity politics. DNC got rid of the super delegates, a good step. The leetennant jackass brays again. This is the Chicken Little jackass, who claims to know the science and can read the graph above. He firmly believes that CO2 will destroy the planet, yet he boasts about his, CO2 spewing, pleasure cruise to Antarctica and his plans to do the same to the Arctic. This is the jackass, who brays at the heretics, about saving the world. Oh auntieoral, you are the pluperfect proof that this world isn't worth saving! rantygoradical spews bile again. It's a plan to Make Aggravation Grievous Again. As decided by you already defining the right answer. The point is that the same data can point at different answers depending on what you assume is the underlying effect, and so the question isn't about their answer but about what you assume to be the underlying effect. It's the classic "IQ test" problem. You want to ask, "1, 2, 4... what comes next? ", well, you have to assume whether we're counting in decimal or base 7. If somebody answers "11", are they right or wrong? Likewise, the fundamental disagreement here is that you are assuming people should always assume that the graph is going down because climate change must be causing the ice to recede and that must mean the trend has to continue downwards and that's the only thing that you should be looking at - and so if anyone doesn't take that assumption then they are "obviously wrong"
But let me restate your analogy in a way that's... actually analogous. A woman has a friend who's a Buddhist Nun. She believes that Buddhist Nuns prefer green tea. It was an anecdote, not an analog, and the point of it flew straight over your head. It wasn't even of the same question, but related to a different point raised by another person. The point was that the buddhist nun was in complete awareness that she doesn't prefer either type of tea consistently so there was no right answer to the question. She can enjoy either, and what she drinks at the moment is what she prefers at the moment, otherwise she wouldn't be drinking it. She asks her friend "Do you like green tea or black tea?" He friend says "I do like green tea but i prefer black tea". That wasn't in the story, that's just you inventing the story to be just so. But thanks for illustrating my point about making assumptions. One of the points of "progressivism" is that an individual is not perfectly conscious of their own condition and needs someone else to tell them what is better and how to get there. Hence, they need a progressive government to chart the course to a better tomorrow. One of the cornerstones of socialist social theory is that an individual is only actualized by their action through the state as a collective animal. That's the same type of rejection of personal responsibility. Instead of "God and country" or whatever you associate with reactionaries, you got total adherence to Nanny State and collective will. Collective opinion tends to be more oppressive, because strict rules allow for certain eccentricities while collectivism keeps you guessing. Then one has to remember that the state is never the same as the people (the most despotic regimes tend to be named "the people's republic of..."), you get the real point of progressivism: autocracy by the back door. All progressivism is practically: "You have a problem we just defined. We can solve your problem for you - all we need is the keys to the kingdom." The question is, how do you do -real- progress without falling into this trap every time?